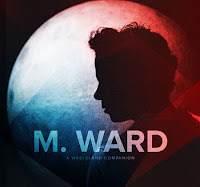 I've grown so accustomed to hearing M. Ward as part of other projects (She & Him, Monsters Of Folk), that I've really forgotten what he sounds like on his own. On April 10th we get his sixth studio album, A Wasteland Compilation, to help remind me. In reality, Ward on his own can at times sound like either of those side projects. The most obvious comparison to his She & Him output is "Sweetheart", a '50s vibed number featuring ooooos and handclaps, and oh right Zooey Deschanel. The cheeky keyboard pop of "Primitive Girl" is hard to resist as well. If it weren't for strangely overwhelming cymbal crashes, "I Get Ideas" would fall in with these as well. The album opens with "Clean Slate", a dusty picker on which you can hear the warm squeaks of the guitar strings. The understated "There's A Key" is firmly ensconced in Monsters Of Folk territory. So is "Crawl After You", a long song that would be cheesy if it came from almost anybody else. However Ward also has a distinctive thread of songs that fall into neither category. There's a darkness to songs like "Watch the Show" and "Wild Goose" that you don't find in his other work. These songs also tend to be the album's weakest though. The title track is completely uninspiring, while the dreamy "The First Time I Ran Away" seems to take forever to go nowhere. For an album that has at least three distinct musical styles on it, A Wasteland Compilation flows surprisingly well. Unfortunately, too many of the songs are too forgettable, leaving you without much of a lasting impression. Best tracks: "Primitive Girl", "Sweetheart"